Centre-back Eric Abidal and midfielder Samir Nasri were missing when France coach Didier Deschamps named a 24-man squad on Thursday for next week's friendly against the Netherlands. Forward Antoine Griezmann was one of two uncapped players, along with left-back Lucas Digne who replaces Manchester City's Gael Clichy, called up for Wednesday's game. The 22-year-old has scored 19 goals in 38 matches in all competitions with Real Sociedad this season. Winger Franck Ribery and centre back Mamadou Sakho, both recovering from injuries, were named in the squad. 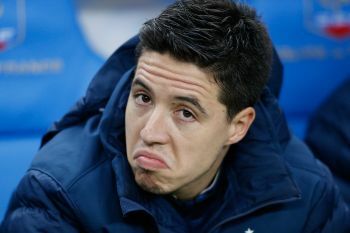 Manchester City's Nasri was disappointing when France lost their World Cup playoff first leg in Ukraine in November, before they recovered to win the tie without him at Stade de France. Abidal, who is having a hard time at Monaco, suffered the same fate at the end of last year. Asked if Abidal and Nasri had lost their chance of playing in the World Cup in Brazil, Deschamps said: "Interpretations are up to you. Many players are out of the squad and I prefer answering questions about those who are in. "I can't tell you how critical it is to be in this squad. The most important one will be the one I name in June." Porto centre-back Eliaquim Mangala, who won his only cap in a friendly in Uruguay last year, has also been included. Griezmann was banned from all international teams until December 30 following a unauthorised night out with four other Under-21 players between the two legs of a European championship playoff. "You only have to look at his performances with his club," Deschamps said. "He's efficient, he scores and sets up a lot of goals, he can play in all positions in the attacking line, he's really sharp technically." There was more surprise at the inclusion of the 20-year-old Digne, who is a second choice behind Brazilian Maxwell at Paris St Germain and has played only nine league games this season. "He has not played that much recently but he has featured in Ligue 1 for three years, he played in the Champions League with Lille last season, he won the Under-20 world title and he's the top choice for the Under-21s," Deschamps said. "His lack of playing time has not stopped him from being good when he has the chance to play."